Brewed with 17 lbs. of yams per barrel (in other words, a lot of yams! 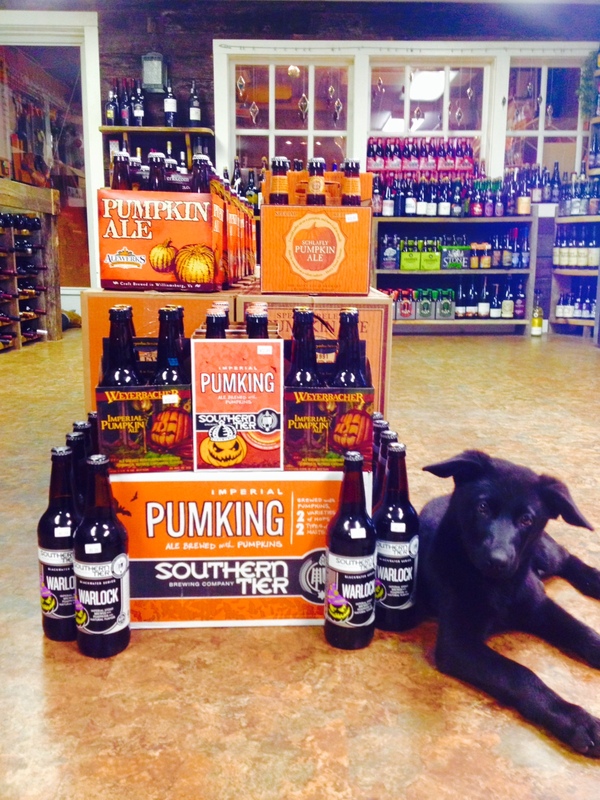 ), this autumn seasonal is a different take on the “pumpkin” beer style. Brewed with cinnamon, nutmeg, allspice, vanilla, molasses, and maple syrup, and fermented with our traditional Belgian yeast strain, this bold and spicy beer is perfect on a cold autumn evening. We have also created bourbon barrel aged, 100% brettanomyces and soured versions of Autumn Maple. Many of us have a passionate love-hate relationship with painfully spicy food and beverage – there is simply something substantial fascinating, thrilling and a little frightening about a burning sensation in your mouth. Scientists are at a loss why humans (and only humans) find such great joy in tasty pain. Perhaps it’s what makes us human – it takes a complicated brain, mixed with weird self-awareness to enjoy events that the body are programmed to treat as a threat but the mind knows better. Test your human skills with this burning beer – mind over body. Fire walk with us. Evil Genius Brewery- New at CRAFTED! Hop forward grapefruit pale ale is brewed and dry hopped with Citra hops. Tropical and citrus notes abound from the hops along with some tart and juicy grapefruit flavors. Who doesn’t love Chocolate and Peanut Butter? A robust and delicious Porter, infused with Chocolate and Peanut Butter using a secret method concocted by Evil Genius. Sweet malts transition into busting flavors of natural peanut butter and chocolate. Chocolate Pumpkin Porter melds together rich chocolate decadence with fall spices. Notes of cinnamon, clove, and nutmeg collide with a delicious chocolate flavor to create a whirlwind of flavor in your glass. Brooklyn Intensified Coffee Porter starts as a big, chocolatey ale, ready to take on super powers. The first power is gained from months of aging in Kentucky bourbon barrels. The second arises from delectable beans harvested by our pals at Finca El Manzano Single Origin Coffee in El Salvador. The final power comes from Blue Bottle Coffee, who roast the coffee to perfection. Brace yourself for complex notes of dark chocolate, vanilla, oak, berries, and dried fruit, coming to intensify you. Their 19th anniversary beer brings the boom, delivering it to the palate in a voluminous, hop-driven thunderclap backed by the power of our brewing passion and intensity. This double IPA owes its considerable oomph to a quartet of Australian hops—Topaz and Galaxy, plus newcomers Ella and Vic Secret. We also had Fairview malt shipped in from Australia just for this brew. The beer’s striking tropical fruit, citrus and peach hop flavors and slightly resinous and aromatically dank earthiness are sure to electrify your senses. They brewed a stout (no, not Black Tuesday, this one is only 5% abv if you can believe it), but we then decided to throw it into oak barrels…and added our special blend of souring bacterias and yeasts. The result is a perfectly tart yet awesomely dark and roasty sour stout. Not a style you see too often – and in our opinion, not a style you see often enough. PUMKING-More pumpkin spice on the tongue with brown sugar caramel sweetening the pumpkin. Medium body and carbonation. Drink this cold – as it warms the pumpkin flavors come out more and become more cloying. WARLOCK-Imperial stout brewed with pumpkins Warlock is brewed to enchant your palate on its own and also to counterpoint our Imperial Ale, Pumking. Make your own black magic by carefully pouring this Imperial Stout into a goblet. Dark and mysterious, the Blackwater Series is serious about high gravity. Reanimate your senses with Warlock’s huge roasted malt character, moderate carbonation and spicy pumpkin pie aroma. Stop in and meet Millie! Now Carrying Millstone- American Farmhouse Cidery located in Monkton, Maryland. Cobbler- Cask aged cider blended with bourbon barrel aged rustic peach wine. A farmhouse spring delight melding candied peach aromatics with tart peach skin flavors and a touch of vanilla. Gingeroot– Cider warmed during the winter months in the barrel with organic baby ginger and infused with raw blueberry honey. A spicy aromatic cider. Farmgate– Unfiltered American traditional oak barrel fermented and aged cider with a blend of our tart heirloom cider apples. A sharp and smokey recreation of pure flavors, farm values, and heritage. The Bruery’s seventh anniversary ale, loosely brewed in the English-style old ale tradition using Belgian yeast. Layered with complex flavors of dark fruit,vanilla, oak, and burnt sugar, Cuivre is a robust ale, surely the perfect beer to mark this major milestone. Just received today; Ballast Point Grapefruit Sculpin is the latest take on their signature IPA. Some may say there are few ways to improve Sculpin’s unique flavor, but the tart freshness of grapefruit perfectly complements our IPA’s citrusy hop character. Grapefruit’s a winter fruit, but this easy-drinking ale tastes like summer. This one-time-only beer by Stone, a fascinating addition to their “Odd Beers for Odd Years” series, incorporates cinnamon, cardamom, clove, ginger, a dash of black pepper and a dose of black tea to emulate the aroma and taste of authentic chai tea. Combine these strikingly piquant ingredients with the classic version of Stone Imperial Russian Stout―with its incumbent flavors of chocolate, black currants, coffee and roastiness―and an already profoundly rewarding beer ascends to new, flavorful dimensions. Sunday Morning Stout, 11.3% ABV, is an American Imperial Stout aged in bourbon barrels. The result? A beautiful ebony pour with a large, creamy, off-white head that lasts and lasts. The aromas of roasted coffee and bourbon awaken your senses while their flavors blend with hints of chocolate, roasted malt, vanilla and caramel. The perfect beer to redefine how you relax on Sunday! Tongue Buckler Imperial Red Ale doesn’t pull any punches. This is a big brew with hops and malt in extreme abundance. The I.B.U.’s (International Bitterness Units) alone test the limits of your palate. Yet while the timid should take warning, Tongue Buckler generously rewards the bold with an exceptional ale experience. Two new Flying Dog arrivals in the shop now! Single Hop “Warrior” Imperial IPA & Brewhouse Rarities “Earl Grey Black Wheat” brewed with Midnight Wheat and Honey malt & Cascade hops. Tasty trio from Deschutes Brewery: “Fresh Squeezed IPA” brewed with Citra, Mosaic and Nugget hops & Pale, Crystal and Munich malts, “Mirror Pond” pale ale, brewed with 4 malts & Cascade hops, & “Black Butte” porter brewed with 5 malts & 3 hops. “Primal Instinct”, an American IPA from Wild Wolf Brewing in Nellysford, VA. Brewed with 5 different malts & 5 different hops, including Cascade that is grown on site. “Redneck Soap Opera” is a Belgian-style Quadrupel which has been spiced with cardamom, orange peel, coriander, nutmeg, vanilla, clove, star anise, cinnamon, ginger, black peppercorn and allspice and aged in rum barrels for three months. New in the shop from Lickinghole Creek craft brewery. “Bitter Valentine” DIPA from Alewerks Brewing in Williamsburg, VA is brewed with Pacific Northwest hops, crystal & pale malts. “Stickin’ In My IPA” is from Champion Brewing Co. in Charlottesville, VA & made in conjunction with NOFX! Brewed with Simcoe, Falconer’s Flight hops and lots of spicy rye. This Spanish wine has a shiny maroon colour, covered in orange tones. The Grand Reserva has complex vegetal aroma’s that remind us of a lovely autumn day; with toasted nuts, pepper, vanilla and balsamico. In the mouth it falls smoothly on the palate and then becomes very tasty and fleshy. Overall this elegant wine has a good structure with notes of oak and wild berries. Bright ruby red color. The nose, good aromatic intensity, high concentration of red fruits, like blackcurrant, raspberry, and blackberry. The palate is rich, round, concentrated, with silky tannins with powerful notes of blackberry, cassis, raspberry, blueberry and extending a long finish. This artistically crafted red wine is a blend of 45% Zinfandel, 45% Merlot and 10% Petit Verdot sourced from some of the best growing regions in California including Lodi, the Central Coast, and Sierra Foothills. The marriage of these grapes contributes to a dynamic and smooth approach accompanied by flavors of blackberry, jam and ripe cherry, which are followed by a hint of spice and vanilla on the finish. This wine was aged in French and American Oak creating a sweet and luscious velvety finish. “Deep Cocoa” from Victory Brewing Co. in PA is a chocolate porter with Tettnang hops and cocoa nibs, malted with Chocolate, Wheat & Pilsner for a delightful complexity. “A Hopwork Orange” from Blue Mountain Brewery in Afton, VA is an American IPA featuring 3 hops and 3 malts which has been fermented and aged on dried orange peel. From 3 Stars Brewing Co. in Washington, D.C. we have “Pandemic”, an Imperial Porter full with roasted malt, coffee and chocolate flavors. Tettnanger and Willamette hops. Delectable. Feeling jazzy? Try the explosively tropical flavors of this Imperial IPA as they dance to the colorful sounds of South African artist Hugh Masekela’s cover of Cantaloupe Island. BOOM!!! This potent pair will get you groovin’ in no time flat! This single hop “Simcoe” Imperial IPA presents rich aromas of candied citrus, tropical fruits, dank flowery hops, caramel malt, mild onion and lemon towards the back. Taste follows with big stone fruit character- peach, apricot, mango, bittering grapefruit, resinous pine and chive onion to compliment the big fruit and malty sweetness. Alcohol is delightfully warming. Mouthfeel is medium-full bodied. This booze bomb is a surefire libation to get you jazzed up for the cold winter season.